ST. PETERSBURG, Russia (AP) — When Vincent Kompany walked off the pitch without waiting to be substituted during a pre-World Cup friendly against Portugal , Belgian football fans feared the worst. Would the rock on which the Belgium team's defense is built miss another tournament two years after a groin injury sidelined him for the European Championship? Not to worry. Kompany knows a thing or two about overcoming adversity in a stellar career that has been disrupted by multiple injuries. 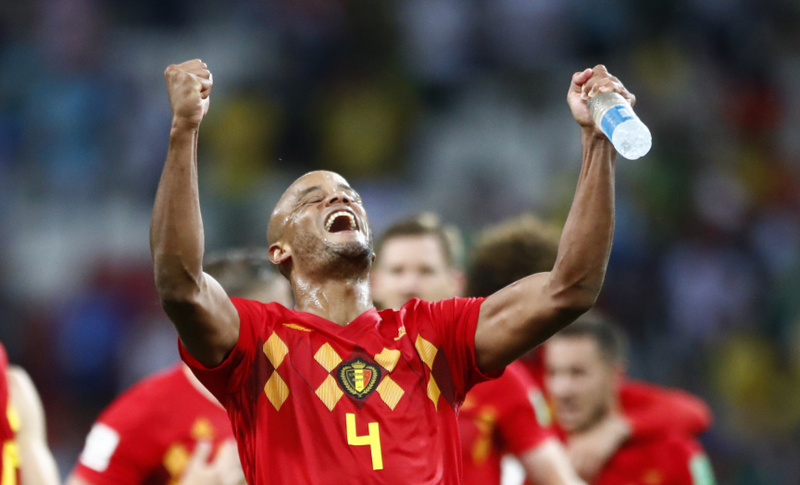 "The fact that I'm standing here today, despite having had so many injuries, makes me stronger," the 32-year-old defender said before Belgium beat Brazil 2-1 to secure a World Cup semifinal berth for the first time in 32 years. So strong in fact that he set up Belgium's first goal against Brazil . His header from a corner hit Manchester City teammate Fernandinho and deflected into the net for an own goal. Now Kompany is getting ready to face France at St. Petersburg on Tuesday in a matchup of two title favorites. England plays Croatia in Moscow the following day in the other semifinal. Belgium coach Roberto Martinez had plenty of reasons for including Kompany in his 23-man squad for Russia despite the injury cloud hanging over him since the June 2 friendly against Portugal. "There's the experience ... there's a little bit the knowhow, there's the communication on the pitch," Martinez explained to those who were sweating on Kompany's fitness. "I think that understanding — knowing what's expected in big games and big moments is important so you don't want to lose any of those players." Martinez also knew that Belgium's draw in Russia meant he could afford to leave Kompany on the bench early in the World Cup — the Manchester City captain was barely missed as Belgium raced to a 3-0 victory over Panama and beat Tunisia 5-2. Kompany's tournament finally got underway as a 74th-minute substitute against England. It was a gentle re-introduction in a workout between two teams already qualified for the knockout stage. Both teams were aware that a defeat could actually be a good result for the remainder of the tournament because it would potentially put them on an easier path to the final. He appeared a little rusty in the thrilling 3-2 comeback win against Japan in the round of 16, but was his normal composed self against Brazil, leading by example at the back as Belgium battled Neymar and co. to cling to its lead in the second half. Kompany was perhaps lucky to get away without conceding a penalty for a challenge on Gabriel Jesus, but also showed his composure when calmly controlling a ball on his chest and clearing it after goalkeeper Thibaut Courtois saved a shot by Douglas Costa and the ball bounced back into the crowded penalty area. He has led by example since his earliest days playing in the Belgian capital, Brussels, where he was born to a Congolese father and Belgian mother. Teammates in youth teams would be scared to go to the locker room after losing, fearing a scolding from Kompany. That desire led him to Anderlecht and soon earned him a move to Bundesliga club Hamburg. After two seasons in Germany, Mark Hughes signed him for Manchester City in 2008. Kompany is club captain and has won the Premier League three times. The list of injuries he has sustained makes for painful reading: toe, Achilles tendon, calf muscle, knee, hamstring, thigh and groin. He has missed more than 100 club matches over the years as well as Euro 2016, where Belgium's talented team only managed to reach the quarterfinals. Now two victories stand between him and what would be Belgium's first World Cup title. The country's best result was reaching the semifinals in 1986, where it lost to 2-0 to eventual winner Argentina. Kompany will lead the Belgium defense against France's speedy attack thanks to his steely resolve. "You have to be mentally strong and have an inner strength to get back to this level every time," he said. "So today I'm here, but it's the result of so many months and so many hours in the gym."